I struggle with distraction when I try to do pretty much anything that takes more than five minutes. In the case of writing, it’s wonderful that modern computers are capable of accessing so much useful and interesting information relative to my projects on the Internet; however, those same resources can turn into a neverending parade of distraction from the task of pounding out prose. It’s too easy to sit down at my computer with the intent of writing, but then ending up spending hours “researching” or just outright wasting time looking at fun websites. I’m looking at you, Reddit. In the interest of getting writing done, I wanted an inexpensive and portable machine I could use for writing–especially on the go. I tried using a Nexus 7 tablet with a Bluetooth keyboard. That solution does work but switching between the built-in soft keyboard and the external one is a pain, plus I never found an easy way to disable autocorrect and the automatic word suggestions while using the external keyboard. The problem is that they take up valuable screen space in a strip across the bottom of the screen, they are highly distracting, and they often force a wrong word into your text which is then a nuisance to fix and distracting from the purpose of writing. They’re great for the soft keyboard but annoying with a physical keyboard. I’ve had my eye on Chromebooks for a couple of years. Chromebooks are lightweight, low-power computers that run Google’s Linux-based operating system called Chrome OS. The idea of Chrome OS is that your computer does almost everything from inside Google’s Chrome browser, including applications like word processing, spreadsheets, and so forth. Google Drive (formerly Google Docs) can’t do everything a full-featured word processor or spreadsheet can do, but it can do almost everything I need when I’m cranking out a first draft of a novel or writing blog entries. Except for the first few posts, every word of this blog was originally written in the word processor built into Google Drive. 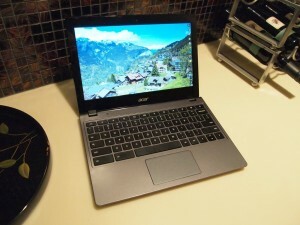 Acer recently had a sale through its Amazon store featuring refurbished Chromebook C720s for $150, normally $200 or more, so I ordered one. So far, I’ve been very pleased with the value for money the unit provides. You can easily search the Web for reviews of the model I bought so I won’t bore you with its specifications and performance, other than to say that the combination of Chrome OS and its Celeron dual-core CPU results in a machine that is quite pleasurable to use, with great performance. Most Chromebooks currently available use single-core Atom processors, which are not nearly as powerful as the Celeron in the machine I bought. One interesting aspect of the C720’s design is that Google, Acer, or both clearly don’t want you to expand internal storage. While you can connect and use USB thumb drives and SD cards, all of them protrude when inserted so it would be a bad idea to leave them connected when you’re not actively using them. I can’t help but think, especially in the case of the SD card which sticks out a good centimeter or so when fully inserted, that this was a deliberate design decision made to keep the user from expanding storage on the cheap. Google especially wants you to store everything in their cloud, and limiting local storage helps accomplish that goal. Have you tried a Chromebook? What has been your experience with these machines? ← Google’s Auto Awesome Strikes Again! Re USB keys, Verbatim (among others) has a very short key – Height:0.3″ x Width:0.6″ x Length:0.7″. It looks like a modern Bluetooth dongle. You could probably keep it inserted all the time. 32G runs $30, more or less. It would be a lot slower than a disk, of course. Will the Google apps work off-line? Does the machine have enough smarts? I have one of these that I bought as a ReadyBoost device for another laptop that I intend to try with the Chromebook. Google Mail and Docs work offline pretty well, but you have to install and configure offline docs and mail before you find yourself without wifi. If you wait until you lack connectivity, you are out of luck, unfortunately, but if you go ahead and set it up in advance of the eventuality of being without wifi, it works OK. Chrome OS is very lean, so performance has not been an issue. I have no idea what kind of dog the Chromebook would be if I tried to load it up with Windows 8. That being said, you can install a minimalist version of Linux on the thing that people seem to like. I don’t plan to experiment with Linux on this box because the whole reason for buying it was to have an even leaner machine than it would be with Linux installed.